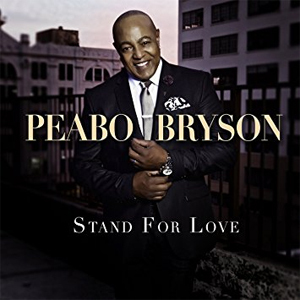 Spin This: "Looking for Sade," "Love Like Yours and Mine, "All She Wants to Do Is Me"
From “Feel the Fire” champion to Disney vocal prince (“A Whole New World,” “Beauty and the Beast”), Peabo Bryson stands tall as one of the blessed R&B male crooners of the late 20th century. He’s abided in the shadows of soul giants like Luther Vandross and Freddie Jackson, but Bryson, a two-time Grammy winner, has always been instrumental in R&B’s giant climb to the masses, even if he doesn’t always get the credit. His last disc, 2007’s Missing You, was released well over a decade ago, and so Bryson’s voice, presence and impact are truly missed. On his 19th solo album, Stand for Love, Bryson returns to the table and is completely updated on the contemporary R&B age we’re in, not sounding dated or ferociously young. He’s somewhere smacked in the middle, crooning over 30-and-up soul and seductive urban beats. And all of this is guided by the attentive direction of Jimmy Jam & Terry Lewis, with John Jackson (Ruben Studdard, Johnny Gill) assisting. The rest of the disc hardly disappoints with the anthemic hip-hop title track (“Stand for Love”) and “Goosebumps (Never Lie),” a sun-kissed churchy gem featuring Gary Clark, Jr. on guitar. Towards the back of the disc, a magical moment happens when Bryson revisits three of his career landmarks (“Feel the Fire,” “I’m So Into You,” “Tonight I Celebrate My Love”) in a live medley guest starring Chante Moore. He sound great on these unforgettable gems, but the live aspect of it feels very mechanical as if it was studio recorded and overdubbed to give off a live euphoria. And some of the tracks feel a bit safe (“Here for You,” “Smile”), as if it’s trying to chase after the overrated Charlie Wilson adult-R&B blueprint. But Bryson delivers the songs with such fervor and without any sign of vocal diminishing throughout the course. At 67 years young, he’s out to prove that he’s still standing and he’s standing strong for love. And the next time you see him on late night TV, he might be hosting a Time-Life infomercial promoting this disc exclusively.